This weeks Things We Like theme Industrial Architecture was chosen by Mila for its versatility. Rightfully so, the group came up with a range of choices including: industrial spaces that are in use today, buildings that were repurposed from old industry, and elements of design inspired by industry. Margaret’s Pick: Becker Architekten’s Hydroelectric Plant, Kempten, Germany. 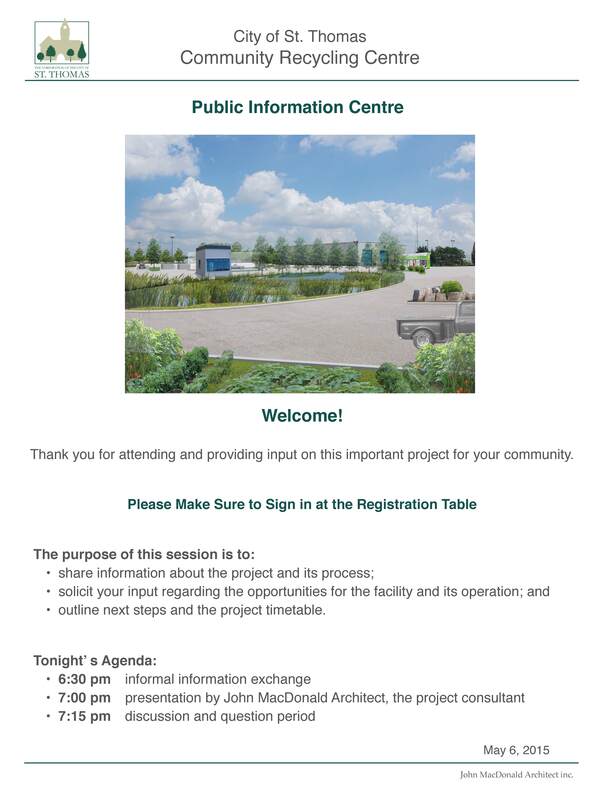 Margaret appreciates the way the plant is integrated with the urban fabric, and wonders if this kind of project would work for Cambridge, Ontario. John’s Pick: Maishama Waste Incineration Plant, Osaka, Japan. This fanciful building was designed by Austrian architect Hundertwasser, who protested the uniformity of Bauhaus architecture. Dee’s Pick: Water Mills. Dee finds beauty in the balance between simplicity and complexity in a water mill. She also enjoys the way many towns and cities were once built up around a mill. Ashley’s Pick: Hale County Animal Shelter, Alabama. 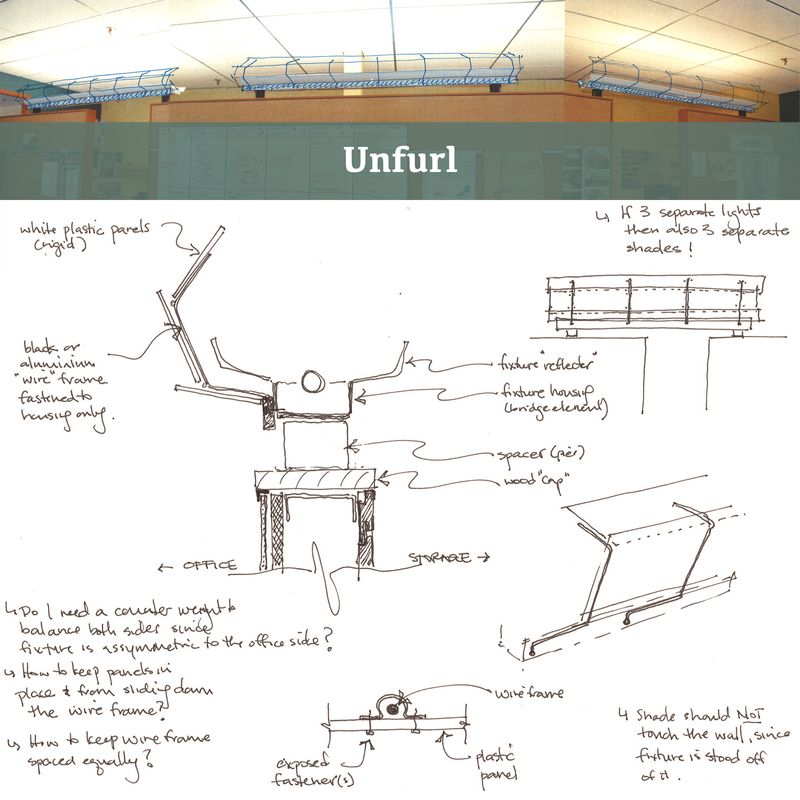 Ashley shared Rural Studio’s project, an animal shelter built using industrial design methods such as a lamella system for the roof structure. Matt’s Pick: Lighting in Schouwburgplein, Rotterdam. 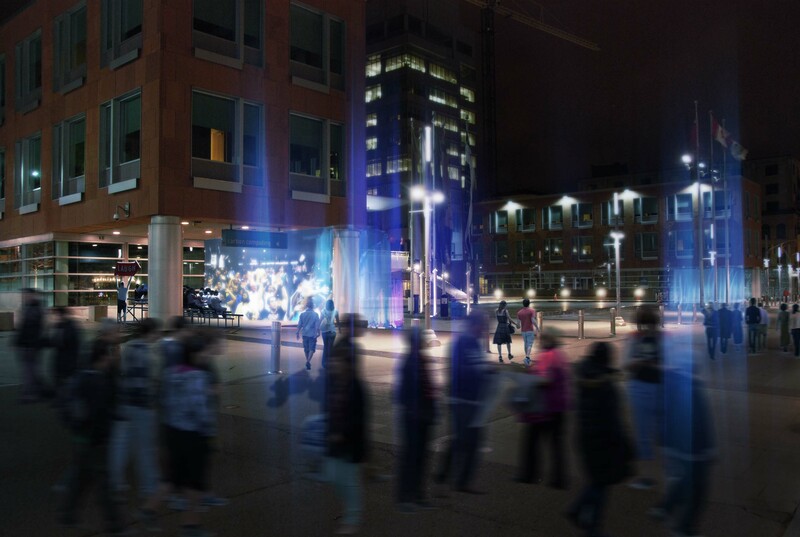 These unique positionable light fixtures are inspired by the cranes in this port city and can be moved to illuminate the many different events and installations that are hosted in the square. Monica’s Pick: Union Station, Toronto. Monica is impressed by the functionality of Union Station’s spaces, throughout all the many renovations and iterations. Jamil’s Pick: Chameleon House, Michigan. This single family home designed by architects Anderson Anderson features elements of industrial design on both the exterior and interior. For many of us, the month of January becomes a time to reflect on our habits and make resolutions. I’ve always found it interesting to ask people about their resolutions. Whether they stick to them or not, we can gain an insight into people by knowing the goals the dawn of a new year inspires within them. Over the past year JMA has engaged in an office wide resolution that has become a Friday afternoon ritual. (No – we haven’t been having a Biggest Loser competition.) Any visitor to JMA knows that our office is a bustling place and we value the time to bounce loose ideas off of one another, without judgement. With this in mind came the invention of “Things We Like”, an open discussion about creativity, innovation, and design. Everybody participates and nothing is off limits, as long as you like it! The idea is simple – at the beginning of each week one member of the JMA team is selected to pick a theme. The theme can be anything; past Fridays we’ve taken a serious look at topics such as Humanitarian Design, Urban Planning, and Intentionally Green Buildings. Other weeks we’ve taken a whimsical approach to Things We Like and gathered to discuss Fictional Architecture or Beds. Once the topic is chosen each member of JMA has the rest of the week to ponder the theme and choose a response to share that they personally enjoy. When Friday afternoon rolls around we convene and have a Things We Like “show and tell”. Each person presents their choice and we use it as a tipping point for open discussion. The conversation it inspires is always informative…and entertaining! During the most recent round of Things We Like I was the lucky one chosen to pick the theme. I decided upon Record Breakers. After enduring many Evil Knievel jokes throughout the week everyone chose a Record Breaker they like. Check out our entries below. As always, the range in each person’s interpretation of the theme and ideas to discuss was fascinating. Monica’s Pick: NASA Vehicle Assembly Building, Titusville, Florida. Largest single story building in the world. Jamil’s Pick: 432 Park Avenue, New York City, New York. Tallest residential building in the world. John’s Pick: The Crystal Palace, (destroyed) formerly London, England. In 1851 The Crystal Palace broke the record for the greatest area of glass ever seen in a building at the time. Ashley’s Pick: World’s Largest Windchime, Casey, Illinois. Matt’s Pick: Bullitt Centre, Seattle, Washington. The greenest commercial building in the world. Margaret’s Pick: Villard de Honnecourt’s Sketchbook, Picardy, France. Some of the earliest found true architectural drawings. Mila’s Pick: Millau Viaduct, Millau, France. Tallest bridge in the world. Dee’s Pick: Capital Gate, Abu Dhabi, UAE. World’s furthest leaning man made tower. Expect more Things We Like blogs in coming weeks! This entry was posted in Architecture, Design, Things We Like on 2017/01/20 by adminjma. Everyone knows about brainstorming, but have you ever heard of DesignStorming? 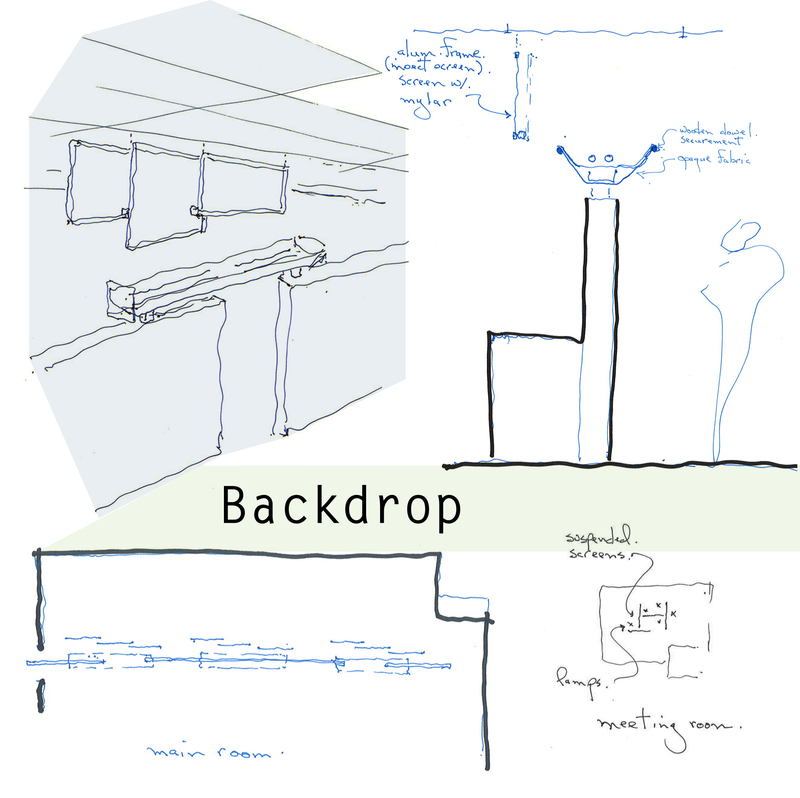 This is a technique we use often at John MacDonald Architect (JMA). It helps to explore the infinite possibilities of a particular project by compiling solutions from different designers with different approaches and styles. 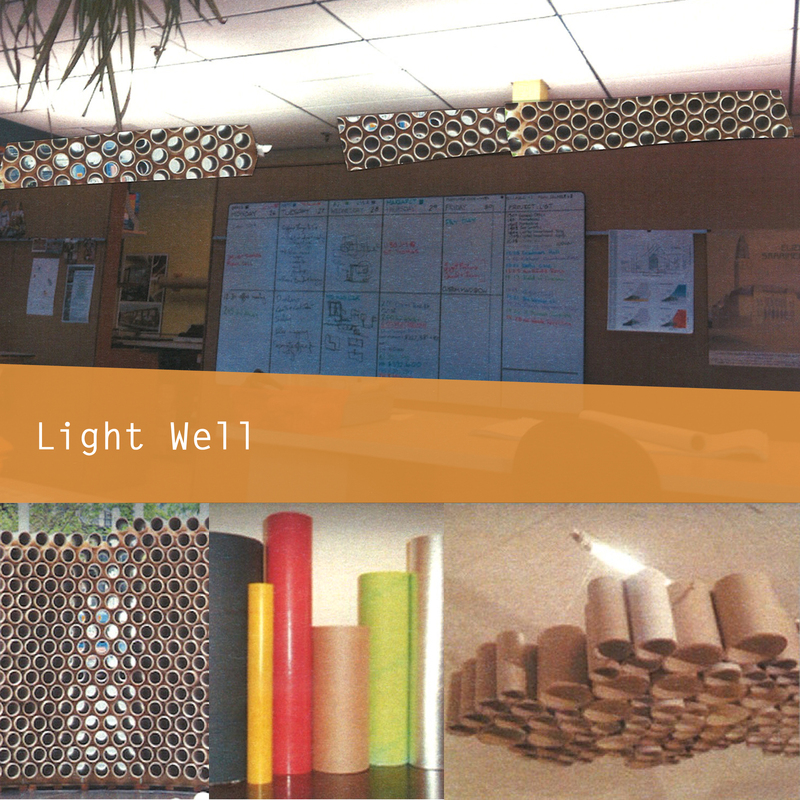 Our most recent DesignStorm was undertaken for a lighting project here in our office. 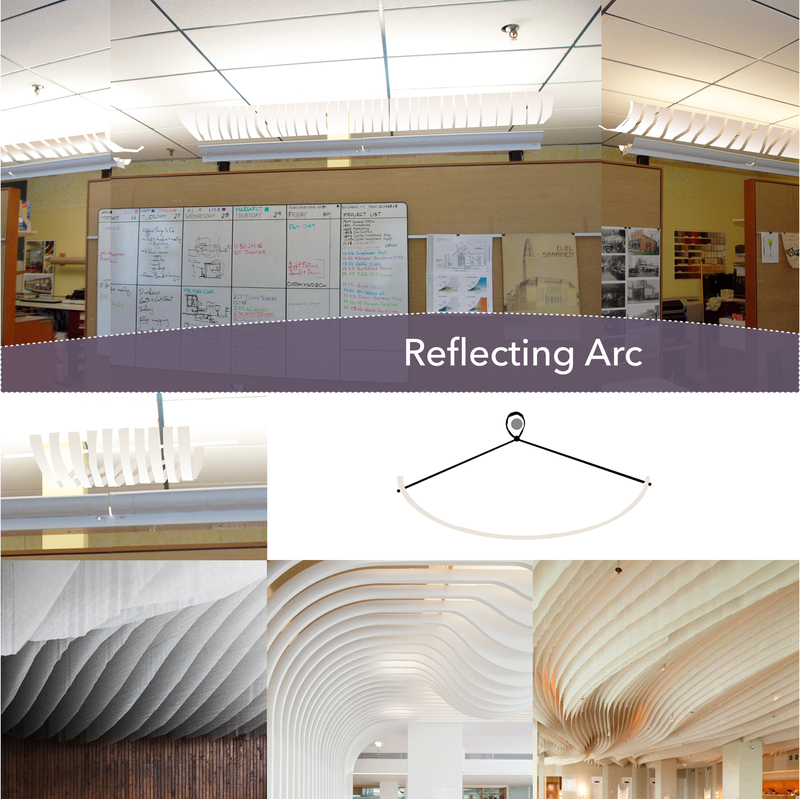 Each designer was presented with the existing situation, which was 3 fluorescent light fixtures that run the length of our office. 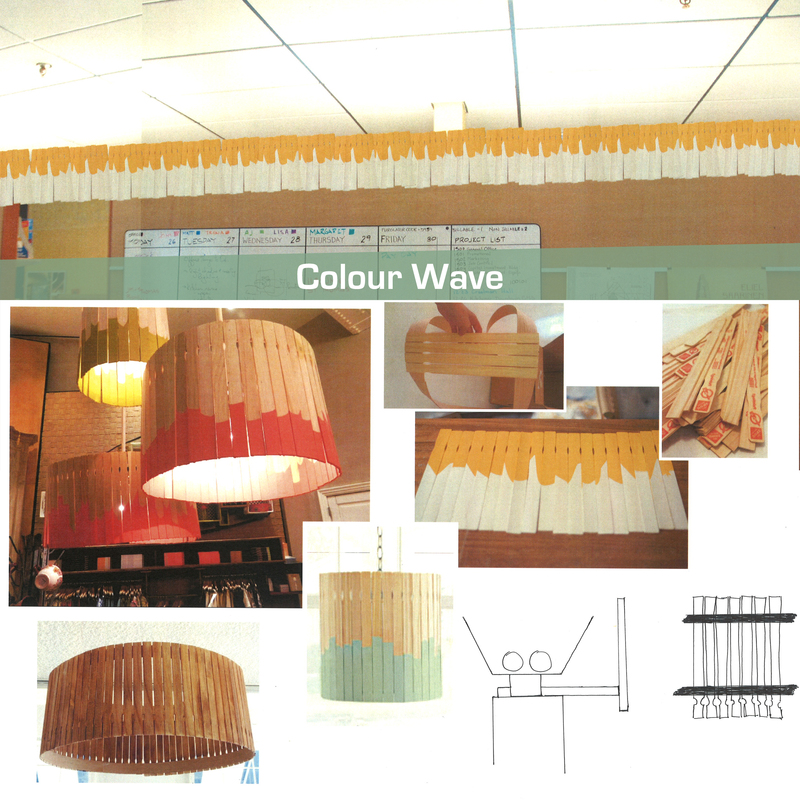 Designers where then given the task; these large, long lights required some form of stylish covering. At JMA we believe that exploring several options and approaches is the key to successful results. We have done DesignStorms for several projects large and small, from a 3000 sq. ft. house to an office redesign, to a little cottage kitchen renovation. The results are always promising and a variety of resolutions are presented, but we call it a DesignStorm and not a Design Competition, because the final design is alway some form of mixing the designs into one, creating the very best possible solution. It is really a process that helps the client see the possibilities and to select the elements that best suite them and their needs. 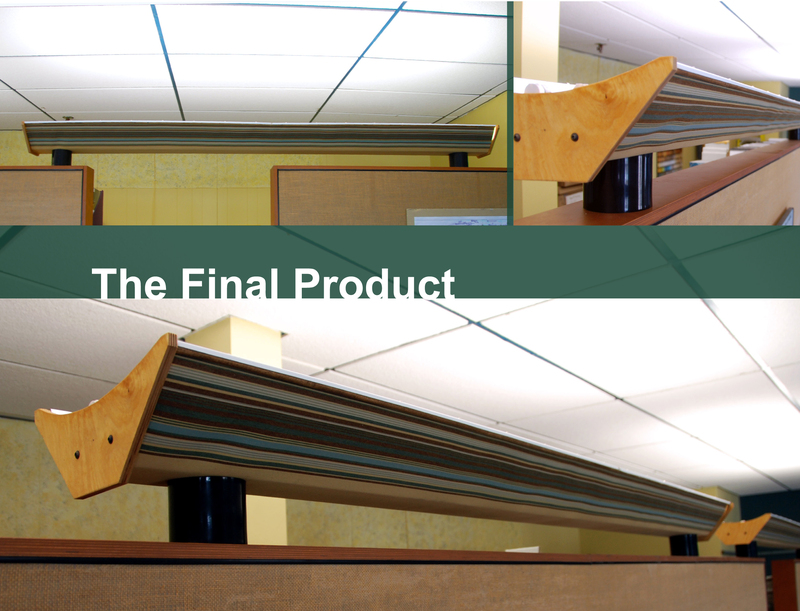 The final design for our office fluorescent light fixtures, wrapping the outside of the fixture with a canvas material and caping the ends with a custom wood piece, keeping the feeling of openness between the main room and storage room. 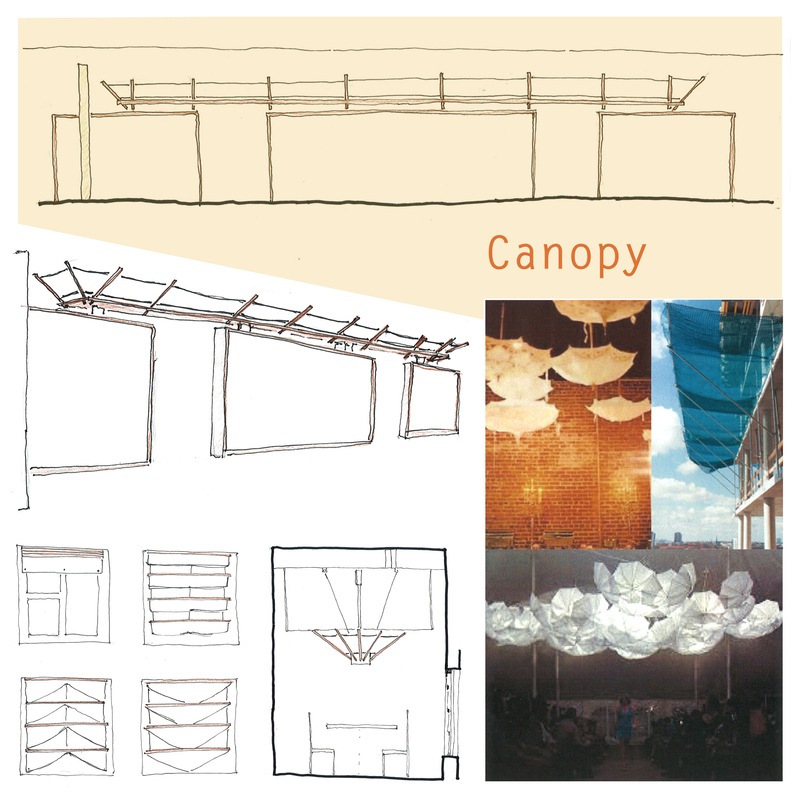 The final product is a tribute to the Canopy and Backdrop designs, merged into a new design that is practical, functional and attractive. This entry was posted in Design and tagged architecture, construction, creating solutions, design, DesignStorm, Lighting on 2015/04/22 by adminjma. Earlier this year, following the call for proposals for Night/Shift 2014, JMA and MT Space sat down to discuss a collaborative piece between our architectural practice and their theatrical one. 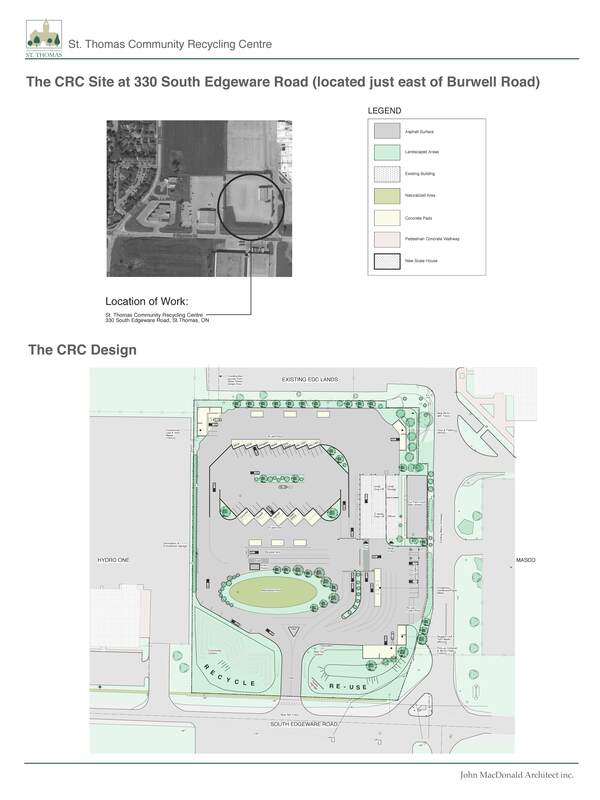 Early on, John suggested we consider doing something that engaged the public space at Kitchener City Hall. We found that both parties were deeply interested in looking at issues of public space in relation to individual identity and community interaction. We wanted to do something provocative, fun and interactive, that would in turn create a dialogue between strangers, and thus Apparitions was born. We came to the title Apparitions for our piece, with the thought that the installation and its actors were a temporary appearance that offered a reinterpretation of the way that people commonly interact with the public space at City Hall. Our actors were in a sense apparitions themselves; slipping in and out of the actor / audience role. After months of development and discussion, the form of the physical installation was decided upon. Since there are two mirrored porticos in front of Kitchener City Hall, we decided to create an illuminated veil with a projection screen at each portico. This would enable audiences to see and talk to each other instantly. At each portico, actors from MT Space would invite festival participants to interact and play across the divide of the civic square. Heedless of this year’s first snowfall, on Saturday, November 1st, an enthusiastic team of volunteers along with friends of JMA & MT Space, worked together, to assemble the installation for its one night performance. 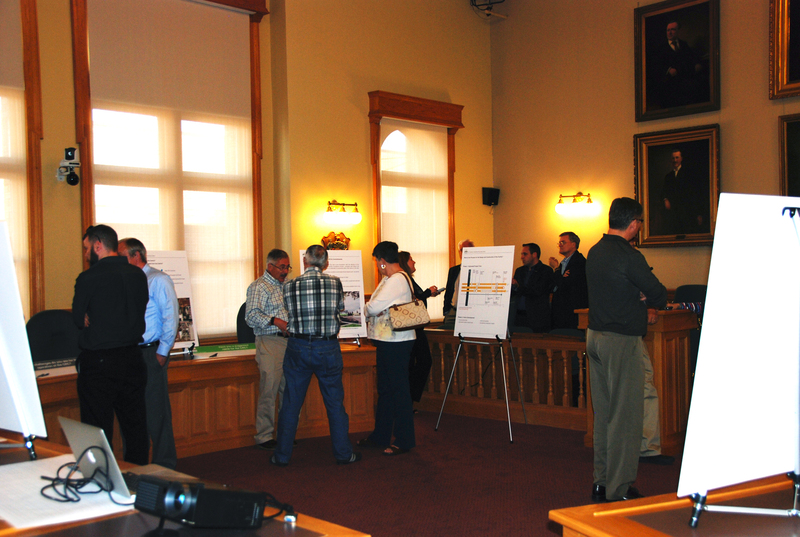 Several sponsors provided us with the materials needed to put on a great show. Although there were some technical difficulties to work through early in the evening, overall the installation was a great success. 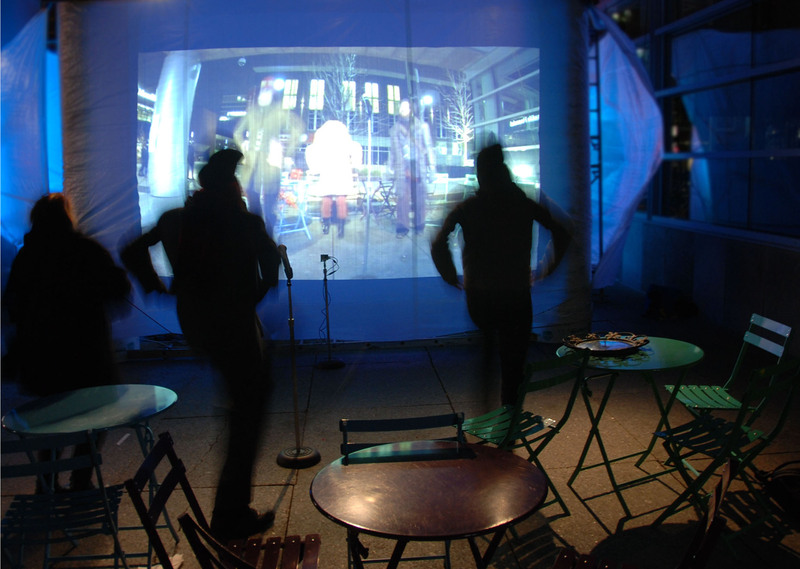 At Night/Shift, people of all ages interacted with each other through the screens of Apparitions, sometimes singing songs, dancing, asking questions to strangers or mimicking actors. It was all great fun and at the same time, reflective of what public space is supposed to do; bring people together. We’d like to take a moment to thank our sponsors who made this possible: Canadian Tire, Kitchener Wilmot Hydro, CRS Contractors Rental Supply, Form & Build Supply, City of Kitchener, Christie Digital and Sherwood Systems. Also to our volunteers, who laboured tirelessly, giving generously of their time and muscle – Thank you for your hard work. This would not have been a success without you. 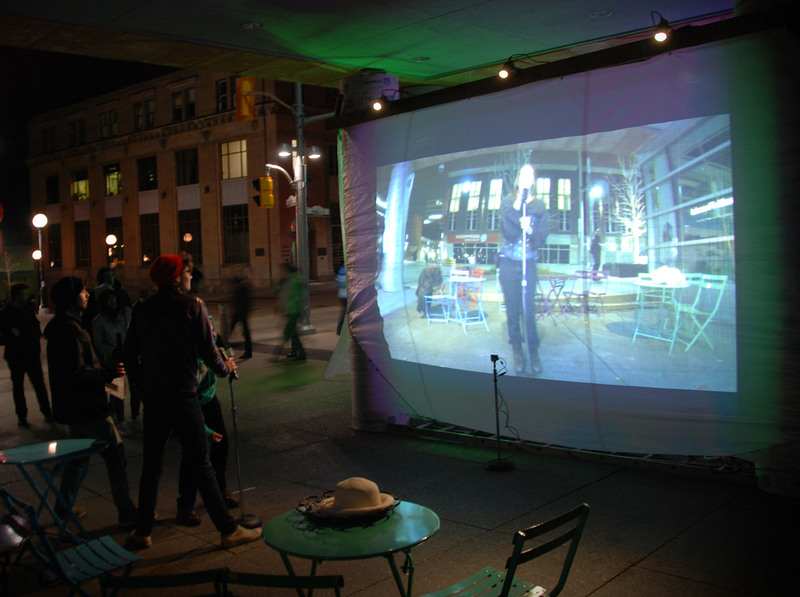 This entry was posted in Architecture, Community, Design, Theatre, Urbanism and tagged apparitions, architecture, cities, community, Downtown, event, festival, installation, JMA, kitchener, Kitchener City Hall, MT Space, Night Shift, Night/Shift 2014, NS14, projection, public space on 2014/11/05 by adminjma.